About 300 people gathered at Ulluriaq School to for a live Q & A with astronaut David Saint-Jacques about life on the International Space Station. What happens when you sneeze in space? That's a question a student at Ulluriaq School in Kangiqsualujjuaq, Que., put to Canadian astronaut David Saint-Jacques on the International Space Station via ham radio. About 300 people from the Nunavik community gathered at the school on Thursday for a question and answer exchange with the Canadian space traveller. 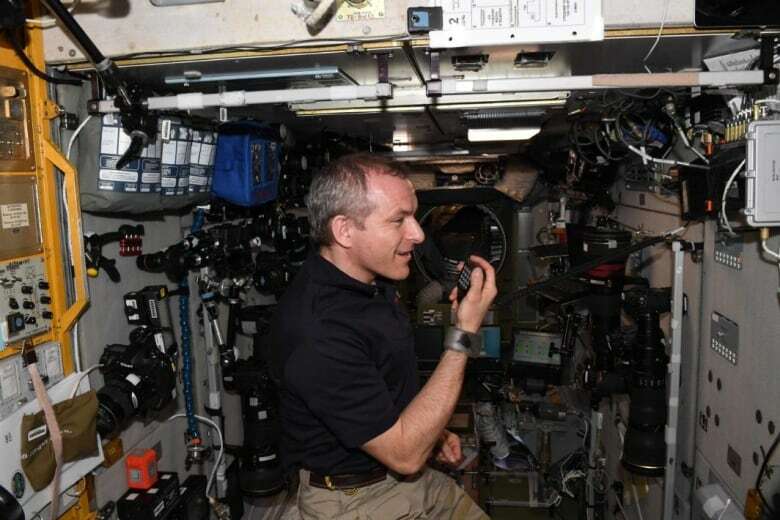 The session was part of the Amateur Radio on the International Space Station program, which connects students from all over the world with astronauts orbiting Earth. The idea is to spark student interest in "STEM" careers — jobs in science, technology, engineering and math. But back to the Kangiqsualujjuq student's question: "Everything you throw away in zero gravity goes in a straight line. If you sneeze, everything will go in front you and you must catch it with your hands or it will hit your friends," answered Saint-Jacques. The long, long-distance conversation was broadcast live on the Canadian Space Agency's YouTube channel. Despite some static, the students got in questions on a number of pertinent topics. It takes only about 10 minutes to get to space proper, but around six hours to get all the way to the International Space Station, said Saint-Jacques. For context, that's 2.5 hours longer than it takes to fly by Air Inuit from Kangiqsualujjuaq to Montreal. Can Saint-Jacques communicate with family from space? They can't call him, but he can call them, said Saint-Jacques. There is also video conferencing in space, "so I can see my children," he said. Is there Wi-Fi on the space station? "It's not as good as on Earth. We go through satellite, so 80 per cent of the time we have a connection," said Saint-Jacques. "It's slow, but it's good. We can get email." A space mission offers a chance to teach young people that science isn't limited to what's inside a textbook, saidAnnie Bélanger, a spokesperson for Saint-Jacques's space mission. "It can be very, very fun," she said. Bélanger said the hope is to get students interested in STEM while they're young. "Canada's future success in the digital economy really depends on leveraging the diverse talent of the K [kindergarten] to [Grade] 12 student population," she said. Saint-Jacques has a personal connection to the North. He's a physician and used to practice in Nunavik. "He told us many times that he brought with him in space the smiles of the Northern Quebec population, and that we can really be inspired by their resilience, their artwork and wonderful collaboration," said Bélanger. She said the Amateur Radio on the International Space Station program is organizing transmissions to other Northern communities — so stay tuned.